Gamma-blog features classic, modern, and streamlined blog design.is beautifully crafted, with great attention to details. Flexible, pretty, and completely responsive layouts make it a great theme for personal or corporate use. Gamma-blog is a bloat-free, yet easy to customize WordPress GPL theme. It is coded with great attention to WordPress standards, the code is easy to understand and modify. If you’re a developper, the theme will make a clean starter for your creation. If you’re a blogger, you’ll get a fast, responsive and SEO ready theme out of the box. Edit layout, typography and colors right in the WordPress Live Customizer. You can change your site title, upload a logo, choose from 6 layout and 6 menu styles, set colors for buttons, header, content and footer, … all with a live preview. Zero coding skills required! Gamma-blog give you the freedom to use the plugin you want, free or premium. Get quality support from their authors, while keeping your website secure and updated. Use your favorite Slider or Page builder, contact form plugin, or any plugin that follows the WordPress standards. 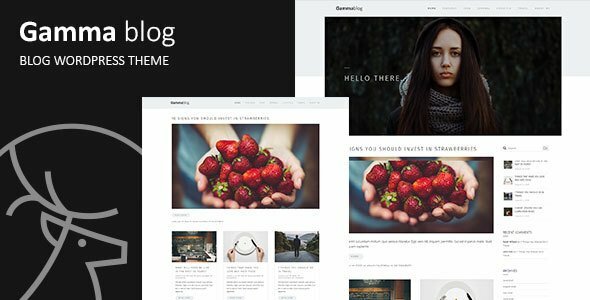 Create, publish and share your content with our easy to use and clean WordPress Blog theme! Thanks for checking our theme!